Is Clueless the best movie of the '90s? Probably. Come check it out on our outdoor screen! Tickets are $7 GA, $5 Students & Seniors! Jane Austen might never have imagined that her 1816 novel Emma could be turned into a fresh and satirical look at ultra-rich teenagers in a Beverly Hills high school. 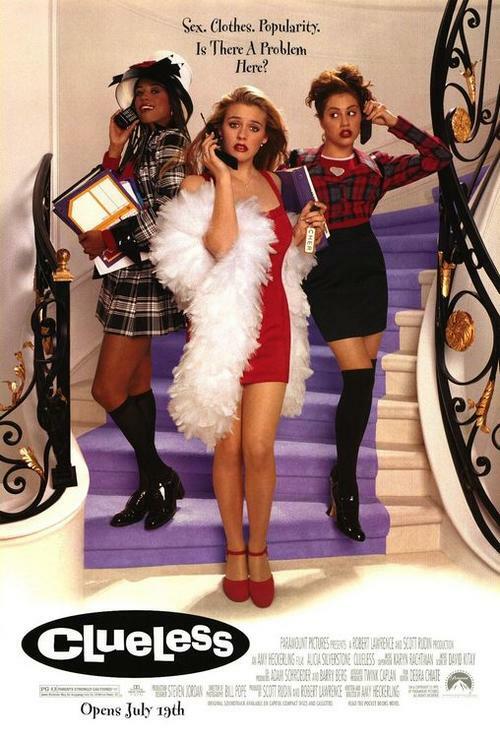 Cher (Alicia Silverstone) and Dionne (Stacey Dash), both named after "great singers of the past that now do infomercials," are pampered upper-class girls who care less about getting good grades than wearing the right clothes and being as popular as possible. But Cher, who lives with her tough yet warm-hearted lawyer dad (Dan Hedaya) and hunky, sensitive stepbrother (Paul Rudd), also has an innate urge to help those less fortunate -- like the two introverted teachers she brings together ("negotiating" herself improved grades in the process) and new friend Tai (Brittany Murphy), who starts out a geek and ends up a Cher prodigy. Cher also possesses her own sensitive side, and she is looking for the perfect boyfriend, whom she ends up finding where she least expected.